​Thank you so much for being our celebrant. Heather was so fantastic on our special day, we meet with her more than once before the day so it was great getting to know her before she married us. She listened too all our ideas and wants and achieved these, also suggesting her own things which was great. Heather is comfortable to talk to and has a beautiful energy. On our special day Heather was cool, calm and collected. There was no rushing our ceremony everything ran smoothly and at a great pace. 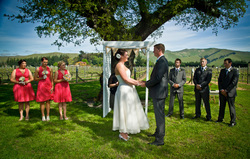 Would highly recommend Heather to anyone getting married in Marlborough region. Heather Sorensen is amazing. She did such a great job and was a pleasure to work with. We knew what we wanted and she was able to offer suggestions to meet those ideas. She ended up picking the perfect spot for us. This meant a lot to us considering it was our first visit to New Zealand. She was able to do this also meeting the budget we were aiming for. She made our vowel renewal really special. The ceremony she prepared was an honest reflection of who we are and our story. Her words were better than the ceremony prepared for our wedding!! Thank you so much Heather, we will always cherish that day! Thank you so very much for completing our special day. You really took time to get to know Callun and I and our four boys. The sand ceremony went better than we could ever of imagined and now we take away a beautiful momento of our journey, and the day we became one family. Everybody commented on what a beautiful ceremony it was so a real credit to you. Thanks again and I will be recommending you to anyone who is looking for an outstanding celebrant! Thank you, thank you, thank you!! I can’t believe just two short weeks ago I ran an idea past you and now, here I am. A married woman!! Thank you for making it all so easy and uncomplicated. Just what I needed when my head was running all over the place! We had an absolutely amazing day and we are all very happy and very blessed to have such amazing people and friends in our lives. Thank you Jane, Shaun and Alannah Peoples. We would absolutely recommend Heather Sorensen! Heather was very helpful, patient and she made us very comfortable step by step through the process. The ceremony was graceful, emotional and fun and very much personalised. Everything went flawlessly and we would like to thank Heather for her input and personal touches she added to the ceremony. We first met Heather at a local Wedding expo and decided there and then that a Sand ceremony was perfect for us. Heather was professional yet made it feel very personal. Although we had a few ‘hiccups’ on the day, Heather helped us through it. So a big Thank you Heather for being part of our wedding day and making it go that little bit more smoothly. Thanks again, John and Chevy Hutchison. We are so happy that we chose you to be our celebrant at our wedding. We felt that you really cared about what was important to us and we loved working with you to create a ceremony that suited our style. Your words were truly special and you are fantastic at what you do. Thank you for playing a part in our big day! Heather, thank you so much for working with us to create our perfect day. You made planning the wedding from the other side of the globe hassle free and your knowledge and expertise ensured that we had an ideal ceremony that was customised to our exact wishes. We feel truly honoured to have had you share in our wonderful wedding. Toby and I were very lucky to have Heather do the official side of our wedding. Heather was so easy to work with and answered all of Toby and I needs. Also Heather had her own speaker and mic which was fantastic as it was one less thing we had to worry about. If you are wanting someone who just fits into what you are wanting for your day Heather is the one for you." Heather you were truly amazing!! Heather thank you so much for being our celebrant- you made the ceremony so special and personal to us!! Kieran and I felt so relaxed knowing you were standing their beside us. We will never be able to thank you enough for the wonderful gift you have given us! Thank you very much! It was our perfect day. There are some photos on Jessica Jones' blog on her website and we are waiting for the rest still. Thank you again for making us Mr and Mrs.
Beginning to return to some sort of normality now. We had a lovely week away and then had more family staying with us over the weekend so it's sure been quite busy!! Thank you so much for a wonderful ceremony and we're glad that you enjoyed your time over at Lochmara - didn't it turn out to be such an amazing day!! Thank you so much for all your work, and thank you for been so accepting with our wedding and all the little different things we did. Thank you for laughing along with us on our big day. It was a great day and went perfectly, even the little mishap with the music when signing the register just added to the laughs of the day. We have been winding my uncle up who did as he is an IT professional so it makes it even more funny that he could not work the i-pod. It was a great day and we could not have asked for more. 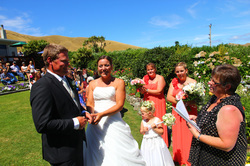 Thank you so very much for the lovely ceremony you conducted on the day for Rachael and Murray. It was a real pleasure to have you here. It was indeed a lovely day and everything went so well didn’t it. The powers that be certainly smiled on us on the day. Initially I stopped by your stand at the local Wedding expo in 2012 and picked up your business card. When I finally set the date I looked at your website and Facebook page.Yes, we were happy with the ceremony you created for us. You were responsive to what we wanted, which was a simple and non-religious ceremony. Our work life is a big part of our life but we wanted the ceremony/day to be about the other side of our relationship and you found the words to reflect that which went well with the reading from my Grandfather.The ceremony ran great on the day. Lynda's Mum here, just to say thank you for beautiful warm loving ceremony. The sand ceremony words were just so right. My dad (Lynda's Pop) was also impressed with the words used, it lead to his reading perfectly. We were exceptionally happy with our ceremony. It was exactly what we wanted and you absolutely listened to us and understood what we wanted. You were very helpful in giving us suggestions and open to our personalisations. We thought your words were beautiful. The ceremony was relaxed and romantic, exactly what we wanted. 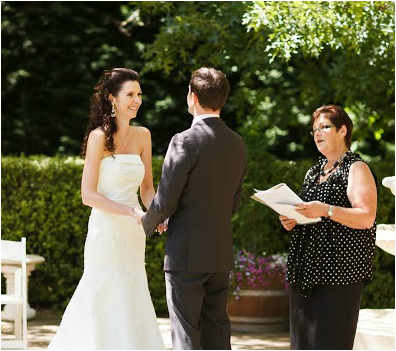 We would absolutely not hesitate to recommend you to other couples looking for a celebrant. What a wonderful experience we had planning our "big day" with Heather!! Such a lovely woman, full of brilliant ideas and always willing to work to what we had in mind...even if it meant finding definitions for words that didn't really exist We chose to include a stone ceremony which was very special, something we had never heard of but immediately LOVED as soon as Heather mentioned it. Our stones, which were placed in our garden by our children, niece and nephew, and our dog Scout, will be something we can treasure forever!! From start to finish, Heather was attentive, thoughtful, respectful of our circumstances and an absolute pleasure to share our wedding day with. She even coped with the howling gale that blew through the whole thing. Thank you, Heather, for making our wedding day truly wonderful......you were AWESOME!!! Thank you so much for being our celebrant for our wedding, we are so grateful for everything you did for us and that you helped us have such a stress free ceremony. We loved the relaxed atmosphere that you created, especially when our best man and groomsmen surprised everyone with burger rings and chatter rings instead of wedding rings for a laugh! We had such a fun time! Throughout the planning stages of our wedding it was great to deal with someone who was always available if we had any questions and would always respond to us professionally and quickly – no matter how small or silly our questions might be! You were a true pleasure to work with Heather, thank you again so much for making our day so fun, amazing and with the best memories one could ask for! Heather was a wonderful celebrant she helped us find a ceremony that suited our relaxed style while still being heartfelt and personal. We loved the sand ceremony and many of our guests commented on what a fantastic keepsake it was. We just want to thank Heather for being part of our special day. "We had such an amazing wedding day and were so pleased that Heather was a part of making our day so special to us. We met Heather about four months before our wedding and she really impressed us with her ability to focus on us as a couple, helping to capture our style, personality and approach that we wanted. 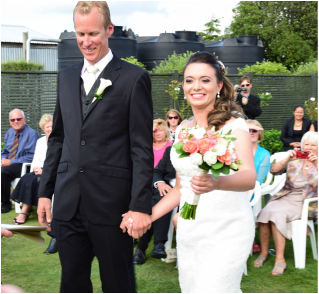 Heather was able to translate our thoughts into words for our wedding service that we really related to and brought a relaxed yet confident style to her role as celebrant. She was a pleasure to deal with, responded to our queries promptly and also gave us the confidence that the legal elements of the wedding service would be met. On the day, Heather was great - she delivered in a warm, confident manner, enabling us both to feel calm and supported whilst also working well in with our photographer and venue. "I found this a fund of fresh information in dealing with Rural Women and life generally." "We haven't been too overloaded and I did appreciate the FUN factor in this." "I have learnt a lot over this weekend - I'm glad I attended." Heather, thank you so much for helping Brock and I become Mr & Mrs, You helped to capture the emotion, the excitement, the fun and the casual relaxed feeling that Brock and I wanted. We have had so many comments about how beautiful and interesting the ceremony was, especially the Wine ceremony It was PERFECT! Guests were wowed with how different it was, and may I say, our combination was yummy! We did not have to worry about a thing, Heather had it all prepared for us. So thank you Heather, it was definitely one of the highlights of our day. We thank you for your time, patience and professional approach. From our point of view it was AWESOME! We’ll be recommending you for years to come. Heather was a great marriage celebrant. 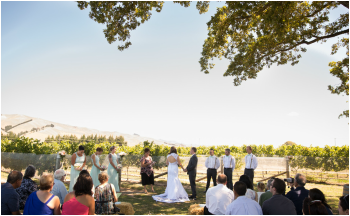 We had no idea about how a marriage ceremony works including how to choose vows and the layout of how the ceremony would run but by just talking to us about who we were and what we had in mind in terms of our ideal ceremony, Heather was able to create the perfect ceremony for us. We loved the vows that she chose for us-we thought they matched us to a T and we also liked the words about the rings and the reading of the hands she gave at the end. We felt that Heather had a lot of input and ideas to contribute towards how the ceremony would run without overstepping any line which was great! All our guests commented on how lovely the ceremony was and we would happily recommend Heather to any of our friends and family getting married in the near future. 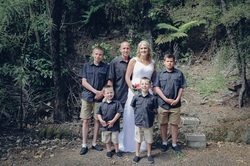 Heather took our son's wedding at Ohope Beach, Whakatane on 4/2/12. She was organised, calm and dignified. Very unobstrusively, she eased the nerves of the members of the wedding party. Heather was in control, but not at all controlling. The service that she had planned, in consultation with the couple, was meaningful and sincere. Nothing felt rushed yet things flowed. Heather gave a beautiful message on 'hands' that we will never forget. After the service, a man I had never met before said, "What a beautiful wedding! It makes such a difference when the celebrant is really good. It was all so meaningful and personal, wasn't it?" Thanks for marrying us. You were awesome to work with. You had everything laid out ready to choose our vows, which made it really easy for us. We had a really great day and we hope you did too. I would recommend you to others. Thanks again.